But walking around as a Zombie just isn't that simple. It's bad enough that you're slowly rotting away, and that your friends and coworkers don't want to have anything to do with you anymore. It's bad enough that dogs try to roll around on you every chance they get. It's bad enough that you're constantly trying to get away from chainsaw wielding fan boys, government spooks and creepy guys in suits. But the constant craving for brains on top of all that, it's enough to drive you over the edge. 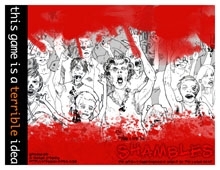 Shambles employs a lightweight system using six sided dice, and focuses primarily on roleplay. You can play it grim, you can play it funny, you can play it gory, just don't play it hungry. The other players might start to look tasty. Version includes 4 modes of play, a great sample scenario, loads of great interior art, and overviews of 6 agencies and organizations to act as aids or foils to the characters. This title was added to our catalog on December 01, 2009.